After a record month of downloads (we’re approaching 6,000 already people – thanks!) we have one of our most coherent episodes yet. It’s as if we’re getting used to this. For we went to a jolly night in Dalston at the Duke of Wellington to see Ian Rigby’s night, Comedy at the Duke. 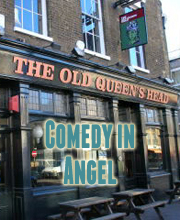 There was an excellent line-up, including old LOL favs Anna Freyberg, Tom Goodliffe and James Acaster, as well as new LOL favs, Luke Benson, Johnny Armstrong and Matthew Crosby from off of Pappy’s. We spoke to Ian, mainly about him being hungry, and caught up with previous interviewee James Acaster to reflect on Edinburgh and bears. We did our best Marc Maron impression on Matthew Crosby too, and found out the best way to intimidate acts on the circuit. On a side note, the Duke of Wellington pub has a barmaid who is probably the most attractive human being in the world. No, really. Loads of reasons to go. And don’t forget our next LOL Live on Friday October 7th, with a fantastic line-up including Grainne Maguire, Hannah Warman, Gareth Morinan and We Are Goose.